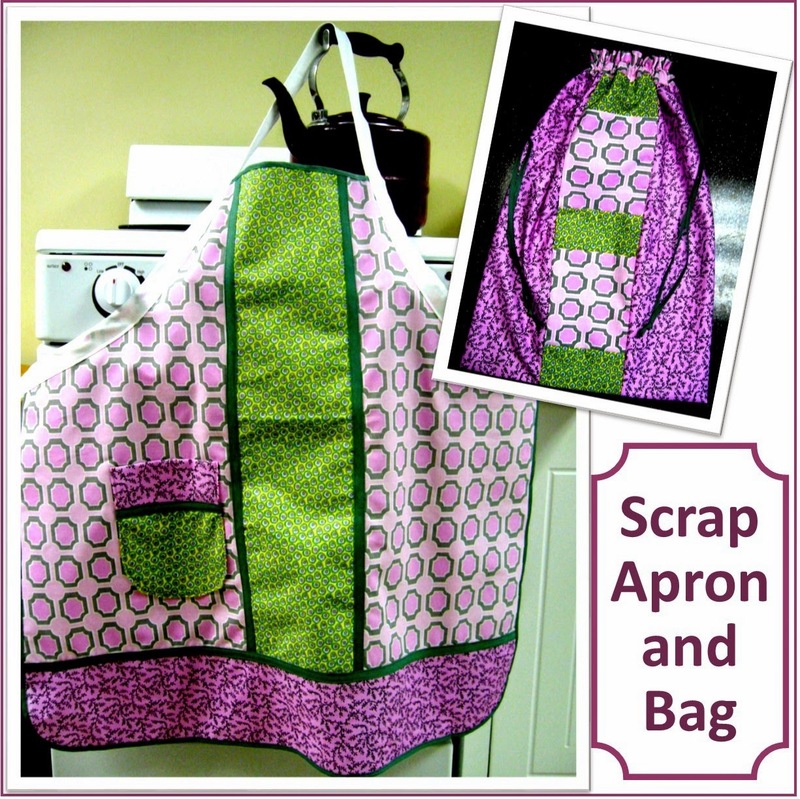 Along with my patchwork pillow case dress, I designed a scrappy apron for my Operation Christmas Child shoebox gift with my scraps. I love to figure out designs and piecing scraps of fabric together so I am having fun making use of my scraps in my effort to purge my stock of fabrics. It is hard to see in this image, but the center fabric is yellow with green vines and pink flowers. If you'd like to make drawstring tote bags for your Operation Christmas Child shoeboxes check out our tutorial: Drawstring Gift Bag Sized to Hold a Shoebox. I shared earlier that I have joined up at the Purging Party over at Stitched in Color and one of the items I am working on purging is all of my scraps left from pillowcase dresses I have made. I decided it was about time to try to match them up and make patchwork dresses for my Operation Christmas Child shoeboxes. I have seen some gorgeous patchwork dresses online but have never tried my hand at matching fabrics, other than two at a time and often one of those is a solid. But I took the plunge and this is the result at my first attempt. As I shared earlier, I have joined up at the Purge-Along party to purge my unused fabric stash. 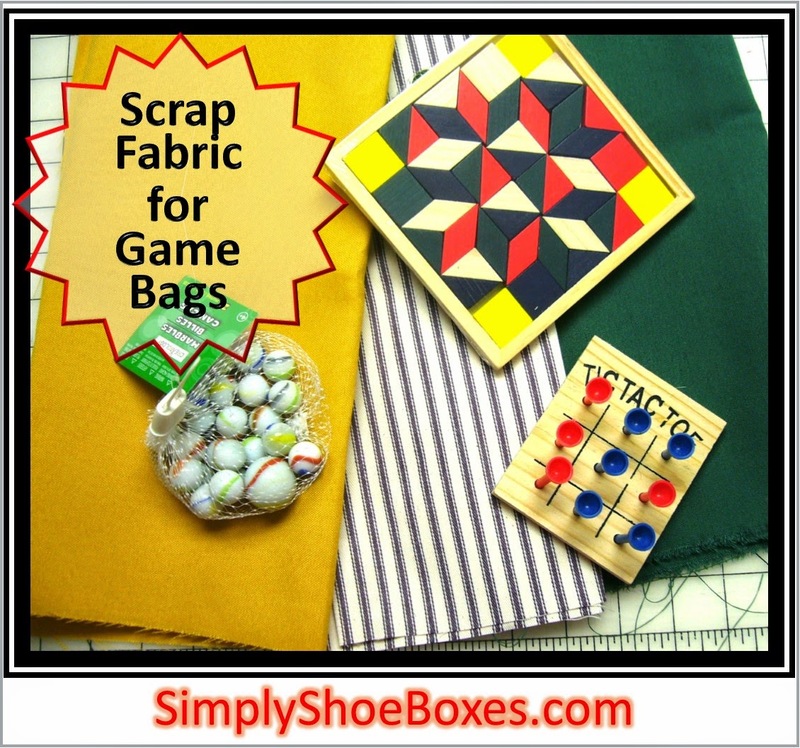 I am having a ball working on gifts for my Operation Christmas Child shoe boxes with fabric I've had in my stash for a while. Like this Noah's Ark piece. I inherited it from my mother-in-law who no doubt planned to make something for my girls when they were young and never got around to it. I wasn't sure what I wanted to do with it so it sat on my shelf, unloved, while other fabrics got chosen first. Then I received the puzzles. 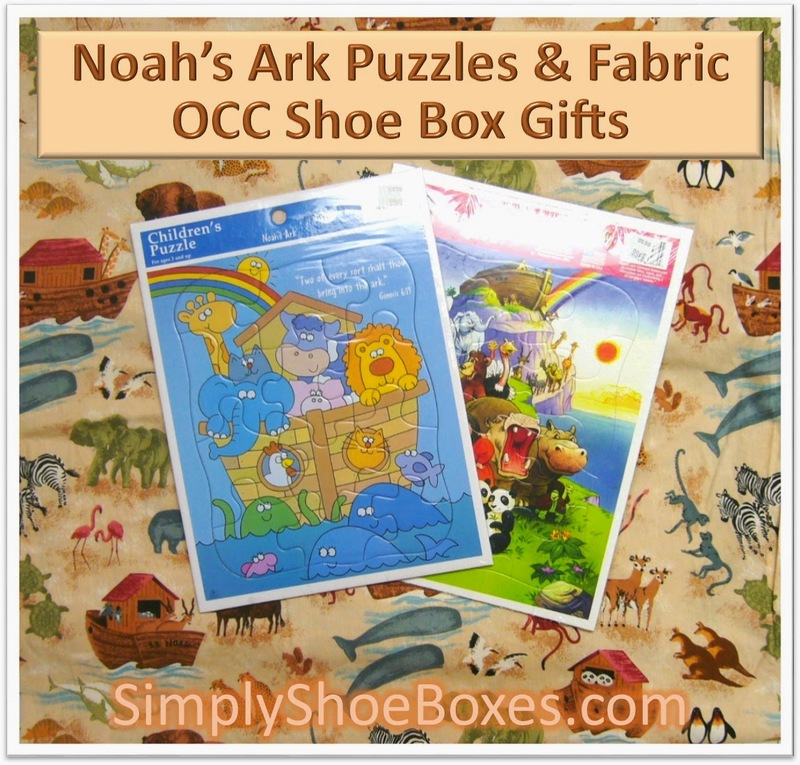 I was blessed with dozens of these two styles of Noah's Ark puzzles that are too large to fit into a shoe box. But if we take off the back and just include the pieces like a jigsaw puzzle they will be great. So I am going to sew little bags and tuck the pieces inside along with an image of the completed puzzle so they know what it is supposed to look like. Thankfully this is a large piece. 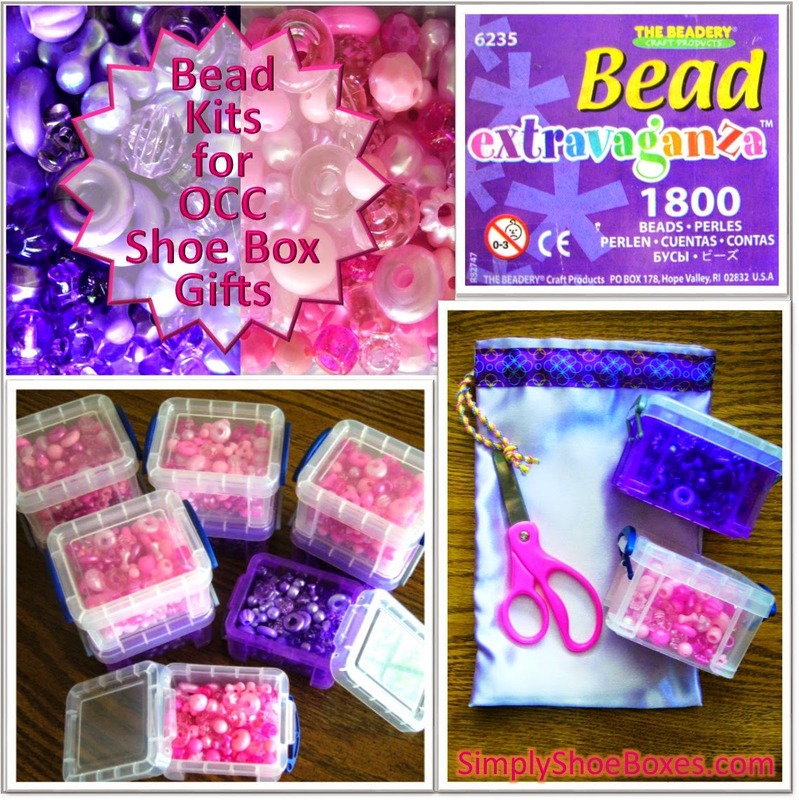 Sometimes it is necessary to get creative to fit an item into a shoe box gift. 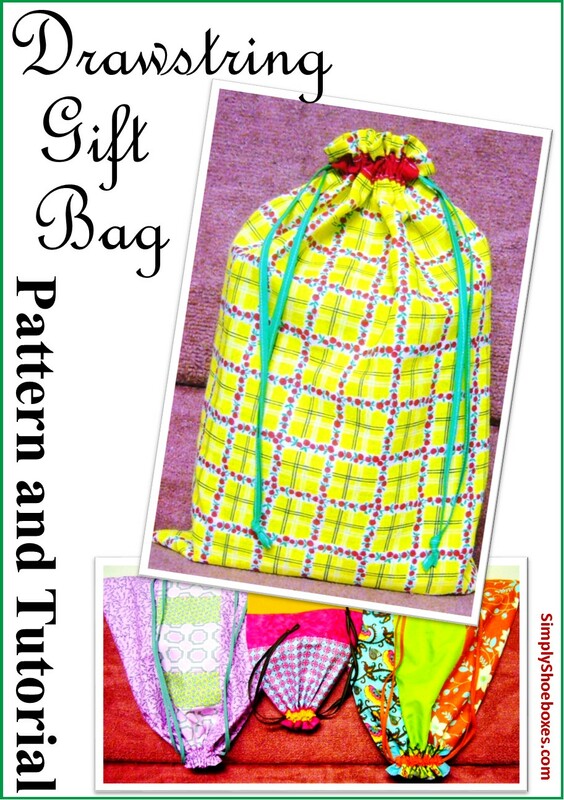 We have several drawstring bag tutorials you can find on our Crafting for Operation Christmas Child Shoeboxes Tutorial Index Page. There are also DIY toy tutorials. I have been having a ball Purging my unwanted fabric and changing it into useful things for my Operation Christmas Child shoebox gifts. 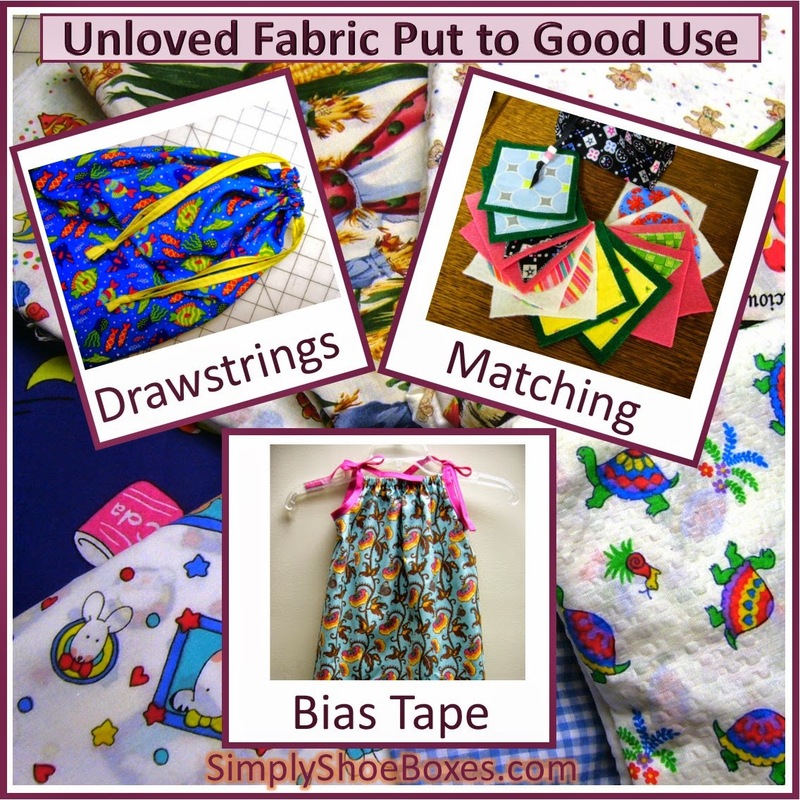 I am so glad Stitched In Color choose to challenge us to purge our unloved and scrap fabrics. 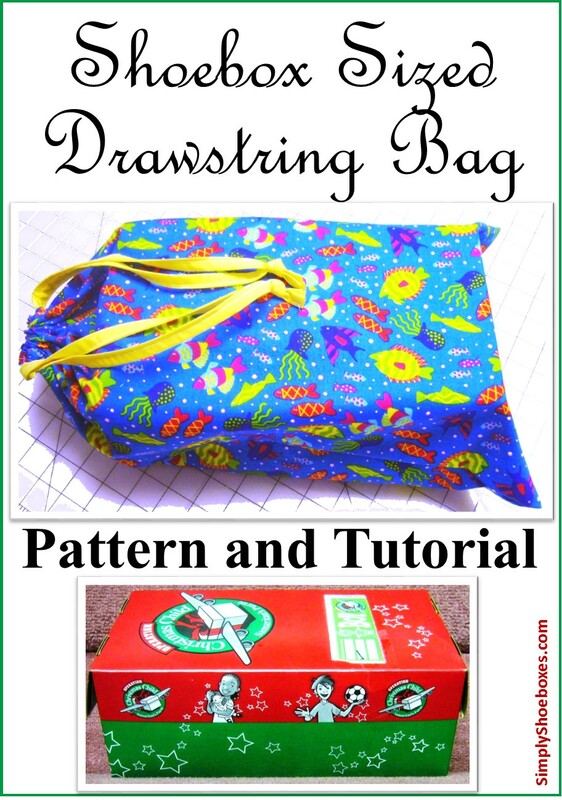 My latest stitching is a drawstring bag large enough to carry the shoebox full of gifts. 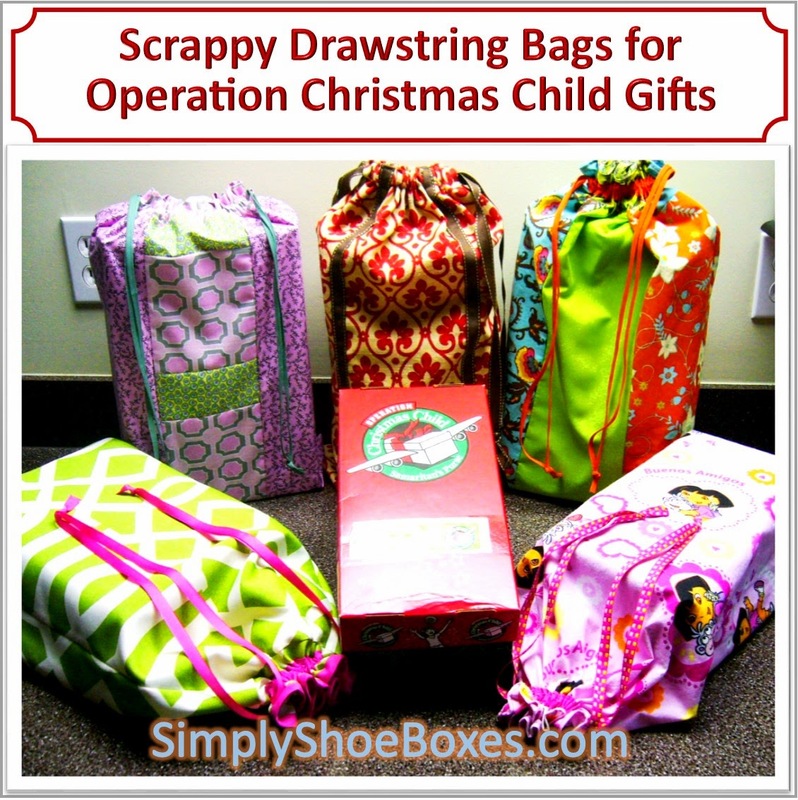 Do you remember awhile back I shared the supplies I had planned out to craft for an Operation Christmas Child shoebox gift with a pillow case style dress as the anchor? Here are the finished products. 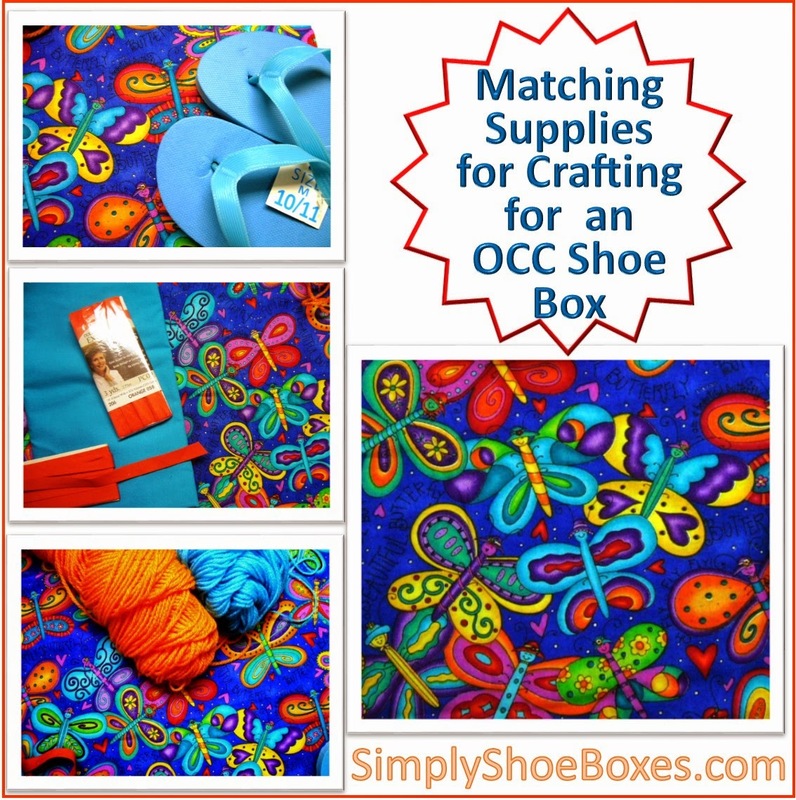 As I shared in my original post, Choosing Fabric & Yarn to Craft for OCC, I focused on the teal from the flip flops. 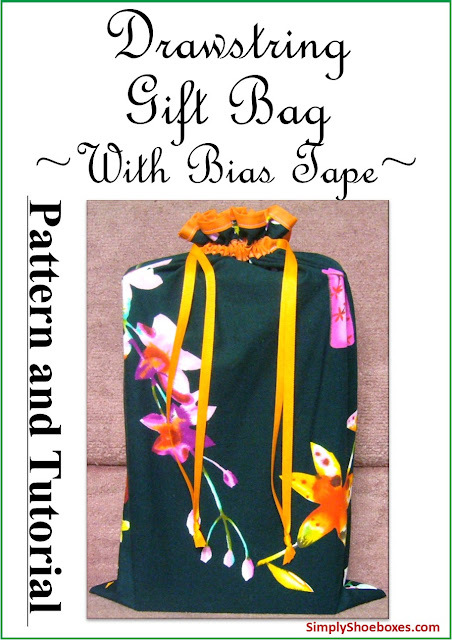 Then I choose my fabric and bias tape and focused on the orange and teal colors. I added a hat and scarf and a purse to match using the orange and teal theme. I thought the little purple platypus and "pocket Pelican" Tiny Beanie Babies matched the bright colors perfectly. I will add school supplies, hygiene items and some more toys to complete the box. 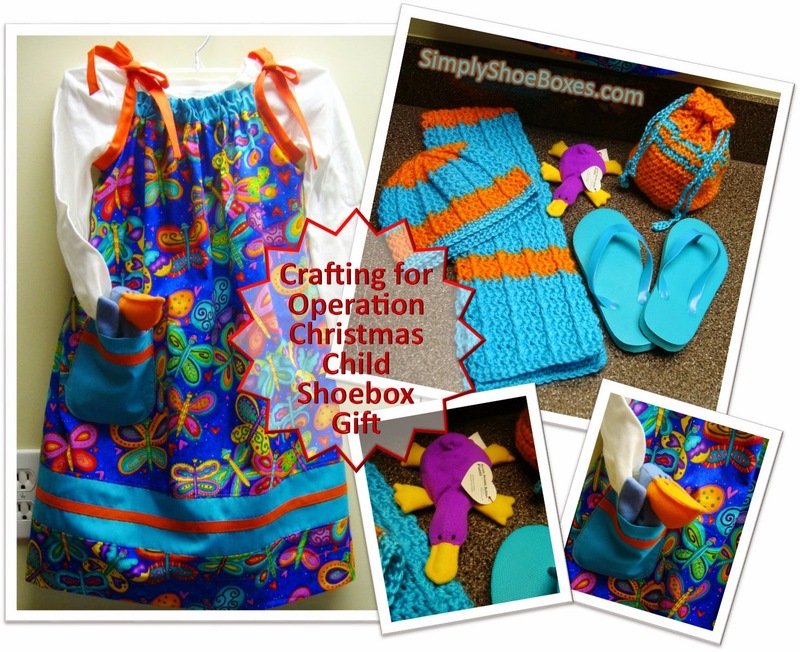 I am currently focusing on my 2 to 4 year old girl boxes for my 2014 Operation Christmas Child shoe box collection. I plan on including a pillow case style dress in each. I have quite a bit of fabric I have been given or inherited, some was received as Christmas presents for this very purpose. My husband picked up some flip flops for me to tuck in these boxes and so I have been beginning with those and matching fabric to them. Here is a bright piece I have been just dying to make up -- I love to include bright colors in my boxes. When my husband found a pair of blue/teal flip flops I knew it would match perfectly. I have some plain teal fabric scraps from another project and I'm adding orange bias tapes to it. I also have orange and blue/teal yarn that I will make a hat & scarf set for the box. I had a lot of fun matching these supplies and using up some of my stash. I'll bring you the finished product when I have it completed. UPDATE: You can see the finished dress and other goodies I included here: Butterfly Dress for Operation Christmas Child Shoebox.